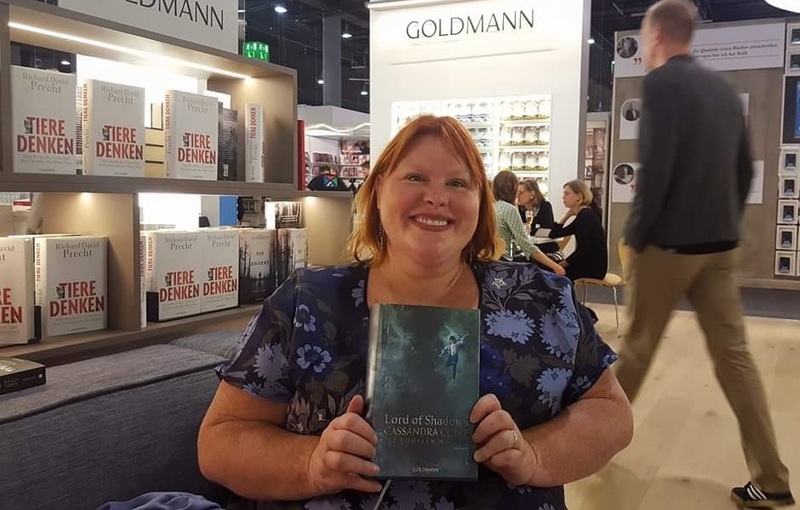 Cassandra Clare’s Lord of Shadows was published in Germany on October 9 so her German publisher Goldmann Verlag brought Cassie to Frankfurt and Cologne to celebrate and meet her many fans. 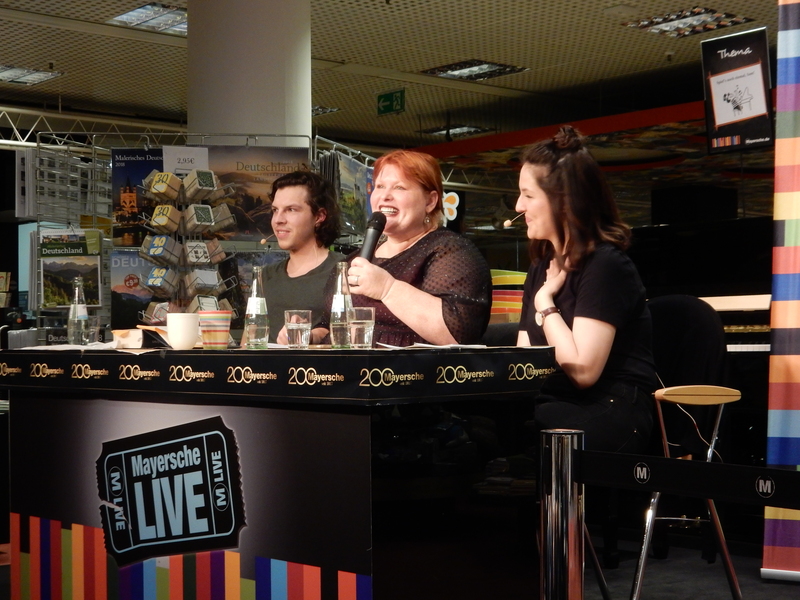 First off, Cassie was at the Frankfurt Book Fair on October 14 and two days later, Cassie was at Mayersche Buchhandlung in Cologne. Since 1) I always wanted to go to the Book Fair, 2) Cologne isn’t that far away from where I live and 3) it’s Cassie whom I love, I decided to attend both events. It's a beautiful day in Frankfurt. Cassie took a picture of the crowd and posted it on her Instagram. Hello 🇩🇪 Germany! The Shadowhunter crowd at the Frankfurt book fair — wow! Liebe deutsche Leser, Es tut mir so leid, dass ich die Frankfurter Buchmesse verlassen musste, bevor ich für jeden in der Schlange signieren konnte. Es kamen viel mehr Leute zur Signierstunde als erwartet und sie hatten mir nur eine Stunde zum Signieren zugeteilt also wurde mir mitgeteilt, dass ich das Zelt verlassen muss und außerdem gab es Sicherheitsbedenken (ich glaube, sie waren besorgt, weil es vorne ein großes Gedränge gab). Ich würde normalerweise nie eine Signierstunde verlassen, bevor die Bücher von jedem signiert wurden und ich bedauere es wirklich. Ich wünschte, ich hätte jedes Buch signieren können! Es gibt noch Tickets für meine Signierstunde in Köln, falls das irgendwie hilft–Alles Liebe, Cassie. UPDATE: I'm sorry, Cologne tickets just sold out! Also pictured: German actor Bastian Hagen, who read from Lord of Shadows and did a fantastic job, and Mona Kasten. Both events started out with Bastian reading from the very first chapter of Lord of Shadows. When he got to the following part “Kit stripped off the demin jacket he was wearing”, Bastian did the same among laughter and some applause. He read until ““I’m Jace, by the way. Jace Herondale.”” and that’s when the interview really kicked off. 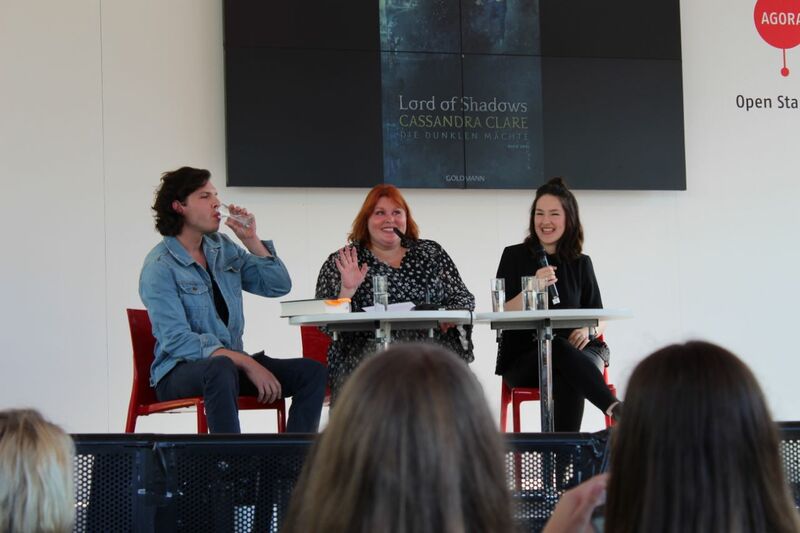 Cassie was asked how she dealt with writing older versions of her Mortal Instruments characters and she did have a lot of fun revisiting them since “they’re a little bit more mature, a little bit more adult, some of them, maybe not Jace” which made the audience laugh. Mona asked what the creation process for the Blackthorn family was like so Cassie, as an only child, admitted that she always wanted to be part of a big family. The Blackthorns are very connected and protective of each other but also all very different. They appreciate their differences and “love each other more for that.” A big family with all these people to love was a fantasy. “The Blackthorns love each other very intensely and would do anything for each other.” Cassie also learned the German word for only child (Einzelkind) so she repeated it while pointing to herself which was very cute. Since Julian is not only the caretaker of the family but also “an evil mastermind who manipulates people and seems to enjoy it”, Mona wanted to know if it was challenging to write Julian, to develop his character. For Cassie, Julian embodies opposites (loving/caring vs ruthless/manipulative). It was a challenge to keep Julian realistic, as loving and dangerous, and to still maintain sympathy towards him. Cassie talks about Julian's two sides: the caring and the ruthless side. It’s a good motto for them, “they clearly don’t pay attention to the Shadowhunter laws and certainly by the third book, Queen of Air and Darkness, they stopped even pretending to care what the Clave wants them to do so it fits them well. The Blackthorns have always been a rebellious family which we'll also see in The Last Hours. “I don’t know if I could pick a favourite. It’s a tie between Julian and Ty. Julian: ability to read minds to manipulate people or the power of persuasion. Ty: visibility to be a detective and to sneak around. Livvy: she would enjoy flying. Dru: she would be like Wolverine and take injuries and heal or maybe strike fear into people. The interview then moved to a pretty serious question about the Cohort and whether it was inspied by the current situation in the world. Writing Lord of Shadows with such a heartbreaking ending must have been a challenge and does Cassie cry while writing such scenes? Mona also asked to which of Cassie’s characters she relates to most? Tessa because she reads all the time and Cassie was the same when she was Tessa’s age. The way Tessa loves books is like Cassie loves books. Magnus although he is nothing like Cassie but he is her favourite. Cassie read until “Once Julian had been the person she could tell everything. Now he was the one person she couldn’t tell anything.” and there were some sighs in the audience at both events. There are going to be five main book series when The Shadowhunter Chronicles are over – The Mortal Instruments, The Infernal Devices, The Dark Artifices, The Last Hours and The Wicked Powers. Was it always Cassie’s plan to have five linked series? The Dark Artifices is a very diverse trilogy, what kind of research did Cassie do for it? Cassie did lots of research for her transgender character. She went to a clinic, talked to doctors & trans women. Anya de Niro also read it. Anya then wrote some notes and gave them back to Cassie. (Anya DeNiro is a fellow author and trans woman. Cassie mentioned her in her acknowledgments). Cassie has several readers who are autistic who read for Ty or Mexican readers who read for Cristina. Cassie got a lot of applause for her answers. Of course you can’t interview Cassie without asking her for some writing advice. Will Queen of Air and Darkness heal Mona’s/our broken hearts and who will be on the cover? Cassie saw the cover for Queen of Air and Darkness this week! Cassie can't promise that Queen of Air and Darkness will heal our broken hearts. She does hope that seeing how the characters do heal will help, though. Mona’s interview with Cassie in Cologne was a bit longer and fans also had the opportunity to ask questions. Mona’s final question: What’s the best and what’s the least favourite thing about seeing your books being turned into film adaptions? I really have no control at all over the TV show and I’m not involved in it in any way so I don’t really have an opinion about it. One fan wanted to know whether writing fan fiction is a good way to start out or whether they should start out creating their own story. They also asked if Cassie liked Shadowhunter fan fiction. Cassie doesn’t read Shadowhunter fan fiction because “in general they advise you not to read the fan fiction of your own work so you don’t get confused. But I’m really glad it exists, it comes from a place of love, you do it because you love the books. I think a lot of authors, who don’t like fan fiction of their work, think it’s disrespectful or they think that people are trying to fix the books and I know it’s not that. I know that it comes from a place of loving the books and wanting there to be more. I’m happy that people write fanfiction about Mortal Instruments and that’s great! But they should not write so much Valentine and Simon! Another fan mentioned Magnus’s short story about Peru and that we still don’t know why he was banned from there. Will we ever find out what Magnus did? Cassie’s short but sweet answer: If we find out why, it’d be at the very end! 1. How does Cassie connect all the stories and remember everything? She started out with a “murder wall” with lots of post-its with names on them and string, but it turned too excessive so she got an assistant whose job it is to keep track of all the connections. 2. Most important advice for being a writer? You should always write down your ideas and write continually. Even if it’s only 300 words, if you write every single day you will have a story eventually. When you see you can do it, it’ll be easier the next time. 3. The hardest scene to write in all of her books? The end scene of Lord of Shadows. 4. The first character Cassie created in her mind? 5. Cassie’s ultimate book boyfriend? I loved going to both events and had a lot of fun! Cassie was as sweet and funny as ever and Mona as well as Bastian did great jobs to entertain the fans. If you are interested in Mona’s books, one of them is going to be published in English very soon. I hope you enjoyed this recap 🙂 Stay tuned for my German/English interview with Cassie which is hopefully going to be posted soon. Header image from Goldmann Verlag’s Facebook page. Cassie waving to fans from my friend Oli – thank you. Thank you so much for this! I really enjoyed reading it all. Ditto! Thanks so much for all you do! I obsessively check for your posts for any extra details we might not have heard yet! ❤ Hope you had a marvelous time. I can't WAIT for QoAAD. But I'm also so nervous. The bit about not promising to heal our broken heart has on pins and needles. I'm so curious where they go. I originally thought maybe the realm of angels but after looking at some of the more recent Thule related pins on Pinterest I'm wondering if they go to the after-life. I really did have a marvelous time and I cannot wait to share my interview with you guys.